On our First World War battlefield tours we tell the story of numerous brave individuals and one of these is army chaplain William Doyle. Doyle joined up on the outbreak of war and served through The Battle of Loos, The Battle of the Somme and the Battle of Messines, before his death at The Third Battle of Ypres in 1917. Father Doyle was a good deal among us. We couldn’t possibly agree with his religious opinions, but we simply worshipped him for other things. He didn’t know the meaning of fear and he didn’t know what bigotry was. He was as ready to risk his life to take a drop of water to a wounded Ulsterman as to assist men of his own faith and regiment. This extract is taken from a letter to the Glasgow Weekly News and was written by a Belfast Protestant serving during World War 1 following the death of Roman Catholic Chaplain Willie Doyle in 1917. This is a remarkable tribute in an era in which Ireland was bitterly divided over political and religious differences. William Doyle was born in 1873 into a deeply religious Roman Catholic Family in Dalkey, County Dublin. He felt a powerful calling for the priesthood and was ordained a Jesuit priest in 1907. He served as part of the Jesuit mission to Catholic parishes all over the UK where he gained a reputation not only for his devotion and energy, but also for his warmth and humour. 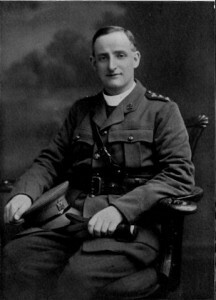 On the outbreak of World War 1 in 1914, he immediately volunteered to serve as a chaplain and was appointed to the Royal Irish Fusiliers in the 16th Irish Division, which was predominantly composed of Southern Irish Catholics; Ulster Protestants overwhelmingly made up the 36th Ulster Division. It was typical of his devotion and sense of duty that he should see his place as being with those of his countrymen facing danger and death. His bravery in joining his men in the heat of battle to care for the wounded or offer absolution and his refusal to leave them whatever the circumstances soon made him known and loved by all. He was mentioned in dispatches at the Battle of Loos in 1915 and was awarded the Military Cross for his bravery at the Battle of the Somme in 1916. A further recommendation for the Distinguished Service Medal was made after the Battle of Messines, but not approved. Doyle displayed an absolute lack of fear and escaped what seemed certain death on numerous occasions. In his last letter to his father written on 14 August 1917, he described some of his escapes and reassured him that it appeared that, “my old arm chair in heaven is not ready yet.” He was killed at Ypres two days later. Following his death his immediate commander, Brigadier and Divisional commander all recommended the award of the Victoria Cross, but this was refused. Though buried immediately following his death, Doyle’s grave was lost and he is now commemorated on the Menin Gate in Ypres.